SKU: 555-COY. 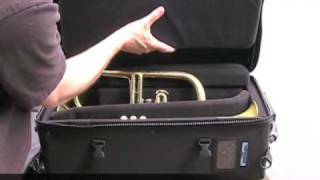 Categories: Multi Trumpet Cases, Replacement Parts. NOTE: The two SNAP set ups can switch back and forth. 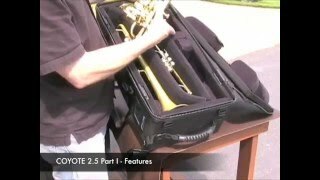 If you own a complete COYOTE™ Snap case T/T/P/C, and wish to occasionally carry T/F/P, simply order the extra 2-piece Flugelhorn Pad Set. If you own a complete COYOTE™ Snap case T/F/P, and wish to occasionally carry T/T/P/C, simply order the extra 3-piece Computer Pad Set. NOTE: If you buy a Snap lid for an existing case, add either the 3-Piece Computer Pad Set (T/T/P/C) OR the 2-Piece Flugelhorn Pad Set (T/F/P) to complete the lid. NOTE: Lids must be custom fit to the bottom half of an existing case. In other words, you will have to send it to us to fit your new lid. Nylon or leather COYOTE™ Mute Bag will hold 4-5-6 mutes, depending on size. 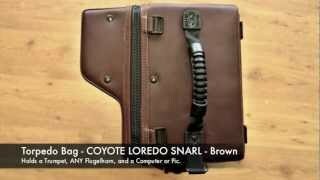 Nylon or leather COYOTE™ Music Pouch will hold 1-2-3 standard size books, depending on width. Back Pack Straps…from Heaven! With a breathable mesh backing and great support. Recommended! Deluxe Comfort Pad to allow Back Packing with the Wheels & Pull option. 2 Piece Flugelhorn Pad Set converts Snap t/t/p/computer to Snap t/f/p. 3 Piece Computer Pad Set converts Snap t/f/p to Snap t/t/p/computer. The leather Mute Bag & Music Pouch DO fit on the nylon COYOTES™, and vice versa. Leather lids can go on nylon boxes and vice versa. 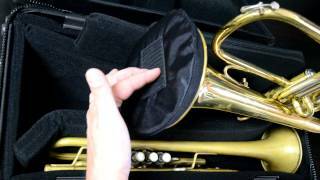 For a list of known flugelhorn fits, click HERE. The legacy COYOTE™ products found here can enhance your existing case. Our re-imagined COYOTE™ is lighter than the Legacy Coyote, and is found HERE. It will be available Summer 2018. If you are buying a MUSIC POUCH for an OLDER Coyote with a rectangular BLUE logo, indicate that in the “notes” box at checkout. (We changed to YKK clips, and the old ones used Nexus clips.) If your Coyote has a circular logo, there is no need to let us know about that. 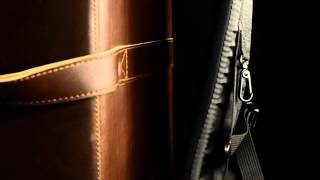 VIDEOS: Back Pack Straps…from Heaven! Nylon Legacy Mute Bag, Nylon Legacy Music Pouch, Leather Brown Legacy Mute Bag, Leather Black Legacy Mute Bag, Leather Brown Legacy Music Pouch, Leather Black Legacy Music Pouch, Nylon Legacy Snip Lid, Nylon Legacy Snap Lid, Nylon Legacy Snarl Lid, Leather Brown Legacy Snip Lid, Leather Black Legacy Snip Lid, Leather Brown Legacy Snap Lid, Leather Black Legacy Snap Lid, 2 Piece Flugelhorn Pad Set, 3 Piece Computer Pad Set, Back Pack Straps … from Heaven!